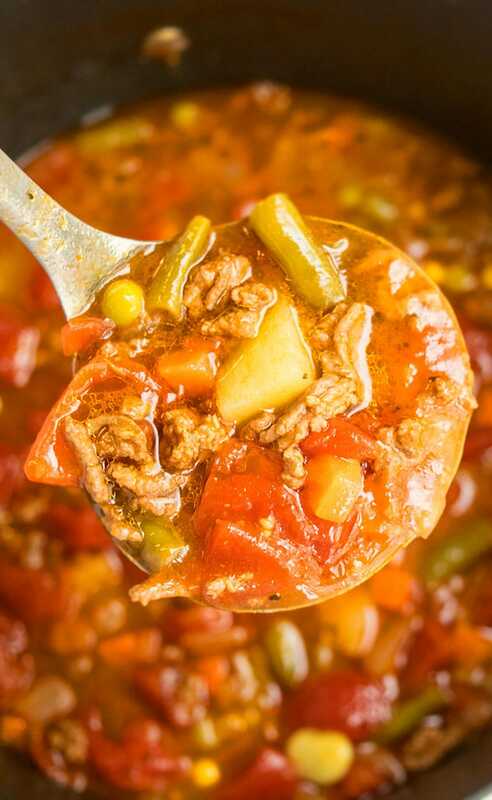 Quick and easy vegetable beef soup recipe, made with simple ingredients in one pot on stovetop. A 30 minute meal, loaded with ground beef, vegetables, Italian flavors. I love making this one pot vegetable beef soup during the chilly Fall and Winter days. It’s a hearty and filling and an easy weeknight meal that’s just as popular with my family as this One Pot Easy Vegetable Soup Recipe. 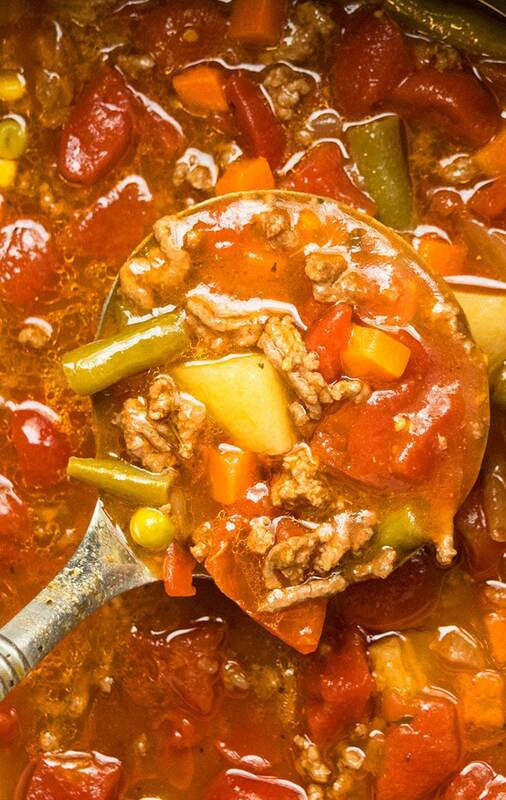 How do you make homemade vegetable beef soup recipe? How to make vegetable beef soup? Heat oil in a pot and saute onion, ginger, garlic, ground beef altogether until beef is brown. Drain fat. Add broth, condensed tomato soup, diced tomatoes, ketchup, potatoes, celery, Italian seasoning and other spices. Then, uncover and add frozen vegetables and cook for another 20 minutes until vegetables are tender. Garnish with parsley and you are done. Ground beef is best since it cooks the quickest but some other options are chuck roast, chuck shoulder, chuck eye roast or top chuck. These cuts of meat yield a melt are the most tender, when cooked. Make sure to use small pieces (1-2 inches) so they cook quickly. Italian seasoning is the best, hands down! However, for a different flavor profile, you can use cajun seasoning or even taco seasoning. How do you make southern vegetable soup? Based on my research, that typically also includes okra and traditionally, beef was not added. However, these days, many people add beef as well (not ground but typically chuck roast that’s cut into small cubes). 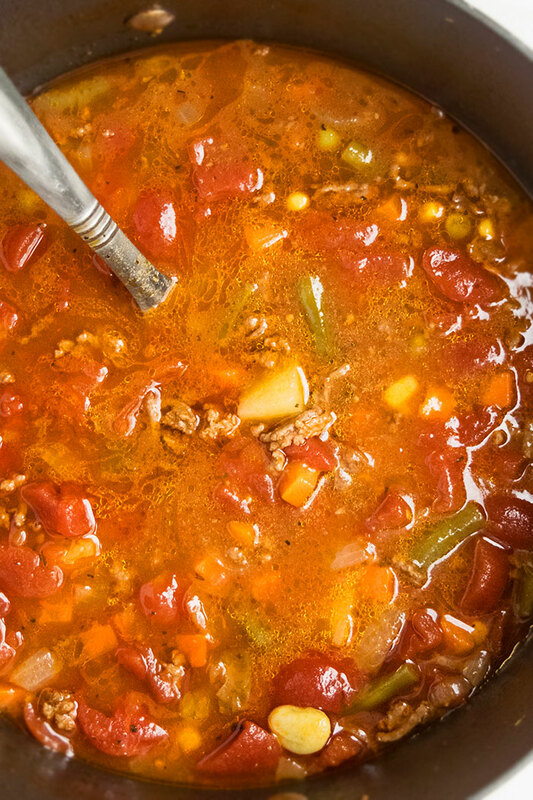 This ground beef vegetable soup is ultimate comfort food! Add 3/4 cup cups barley in this recipe to make it more filling. You may have to add additional broth because barley absorbs the liquid and can make the soup thick. Add 1- 2 cups roughly chopped cabbage, along with the frozen vegetables and let it cook until tender but not mushy. Add 1 – 1.5 cup noodles (broken into smaller pieces) or any other small sized pasta like ditalini or macaroni or small shells. You may have to add additional broth because pasta absorbs the liquid and can make the soup thick. 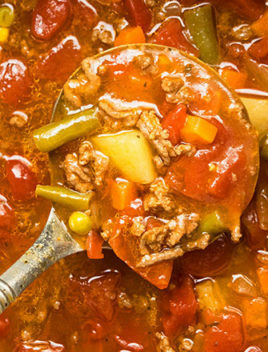 What to serve with easy vegetable beef soup? Also known as Beef and vegetable soup! I use frozen vegetables but fresh vegetables can be used just as well. Please cut your potatoes fairly small in size (about 1 inch pieces) so that they cook quickly. Use a large stockpot because that allows everything to cook evenly. I also prefer using a nonstick pot to prevent anything from sticking or burning. Beef broth tastes the best but vegetable or chicken broth can be used too. Ground turkey meat can be used instead of regular ground beef. Paprika and red chili flakes are optional but a subtle spicy kick. You must drain excess fat because that prevents a layer of fat from floating on top of your soup, which looks so gross! This soup tastes even better the nest day since the flavors deepen overnight. Don’t over-cook the potatoes because their texture will become very soft and mushy. Use low sodium broth because that prevents the soup from becoming too salty. Instead of condensed tomato soup, you can use more canned diced tomatoes. If the soup is too thick, add more broth or water. If soup is too thin, cook without lid on medium high heat to reduce liquid and thicken it. To make a cheesy soup, add 1 cup of a combination of cheddar and parmesan cheese at the end and mix it all together. I personally prefer this soup without cheese. To make creamy soup, add some heavy cream at the end. Instead of potatoes, you can add small macaroni, noodles, rice or barley. Just add them in step 4 and and additional 3/4 cup broth. 1 can Condensed tomato soup Or tomato basil soup, 10.75 oz. 1 can Diced tomatoes 228 oz. Add broth, condensed tomato soup, diced tomatoes, ketchup, potatoes, celery, Italian seasoning, red chili flakes (optional), paprika (optional), salt, pepper and bay leaf. This soup sounds so warming and tasty. Perfect for this cold weather. I love the addition of paprika – my favourite spice! This is my kind of winter comfort food. I love the kick of flavor from the chili flakes and paprika!